If the title has left you scratching your head, you probably aren’t alone. Announced at CES back in January, HP has been quietly selling the enterprise-focused variation of the Chromebook x360 14 for some time now and yes, there is a Core i7 model. Before you go grabbing your wallet, there are some points we should cover. Back in 2016, HP debuted the Chromebook 13 G1 that began a new trend of flagship Chromebooks. Taking its cues from the 2015 Chromebook Pixel, the HP 13 G1 was and still is a beautiful device that offers some serious horsepower and all the premium feels a user could want. Sadly, the HP 13 G1 was met with mixed reviews due mostly to the hefty price tag that was attached to it. To make matters worse, HP began offering a “customizable” version that really didn’t bring a lot to the table in the realm of upgrades but nearly doubled the price of the consumer model. These customizable Chromebooks were geared towards enterprise accounts and I’m sure they sold their fair share with bulk discounts but the cost just never made sense to me. I, personally, had multiple conversations with HP reps trying to get some insight as to why the price was so high but at the end of the day, it was simply because they could be customized. Ok, whatever. 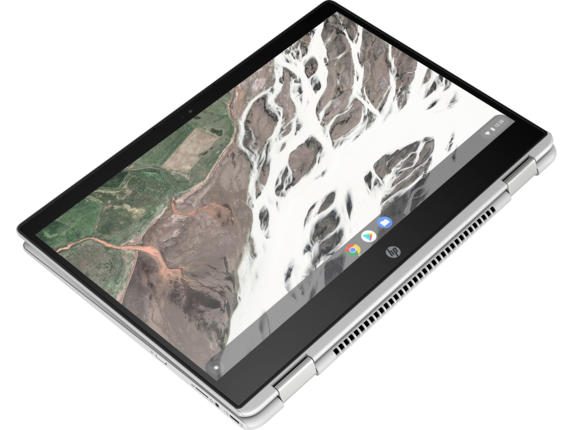 Well, HP has gone and done the same thing with the 14″ Chromebook x360. Under the customizable option, you get your pick of the 8th gen Core i3 or Core i5 paired with 8GB of RAM or the Core i7-8650U matched with 16GB of RAM. All three models offer a slightly above par 64GB of eMMC storage. The cost? For the big boy, you will have to fork over $2191. Yeah, I know, crazy. You can pick up a Core i7 Pixelbook for around $1300. Granted, the U-series in the HP is way more powerful, the Pixelbook offers 512GB of NVMe storage and well, it’s a Pixelbook. However, we’re huge fans of the HP Chromebook x360 14 and the consumer model is a solid buy if you can grab one for under $500. Shoot, I’m writing this on mine as we speak. If I could get this device in a Core i7 and double the RAM I currently have for around a grand, I would definitely be tempted. If you feel the same, today may be your lucky day. HP is running some “weekly” deals and you can get the beast of a Chromebook for a whopping 43% off the staggering $2K+ price tag. With the discount, that brings the x360 down to $1248.87 and believe me, I know that’s a huge chunk of change for a Chromebook but at the same time, you’d get the most powerful Chromebook on the market for roughly the same price as the mid-tier Pixelbook that is now a generation behind in the processor fight. Speaking of processors, the HP Chromebook x360 14 G1 currently has a platform-exclusive with that Core i7. It is the same 8th gen chip found in their top-model Chromebox and is slightly more powerful than the Core i7-8550U found in Chromeboxes from Acer, ASUS and CTL. The performance boost is probably negligible but it’s interesting to see a Chromebook with a completely unique internal setup compared to the comparable devices on the market. Anyway, HP’s site doesn’t say how long the sale will last but for now, at least, you can save some serious cash on a serious Chromebook. I can honestly say, it’s probably worth every penny to a user who is going to use that kind of horsepower.